Know what goes on in your backyard. We encourage residents to be alert and attentive to any suspicious activity. Winlow Place and the surrounding neighborhoods work together to keep clean, safe streets. The Constable Patrol Program is currently in effect. Please visit their website to subscribe – like ours, it has the ability to accept online payments. There is also quite a bit of background information, details related to services and payments, as well as crime statistics on their website. You may also request further information by emailing info@mwpatrol.org. The Mandell Winlow Security Foundation is a separate entity from the Winlow Place Civic Club, and its operations/board are separate as well. While Winlow Place Civic Club is a separate organization, we will still be providing our residents with information so that they can access/subscribe to this service if they are interested. Because the Security Foundation is completely separate from the Civic Club, your Winlow Place Civic Club dues do not count as a contribution to the Security Foundation and vice versa. The Winlow Place Civic Club appreciates your continued support. The system is a "subscription" service with an estimated cost of ~$395/year per household. Special arrangements may be made for seniors or those on fixed incomes. Subscribers receive benefits such as vacation watch, a direct-to-dispatch line (with an extremely fast response time), a sign for their yard (similar to ones from ADT), a home security audit amongst other things. If a home does not choose to subscribe, they still generally benefit by having a dedicated patrol around the neighborhood. Patrol officers would, of course, stop any crime they see whether the home is a subscriber or not. The more people who participate, the lower the annual fees may be moving forward. The security service has been in effect since October 3, 2015. One of the best deterrents of crime is to keep your eyes and ears open. Report any suspicious activity to your block captain or or the Winlow Place board members. By doing so, our officers will be able to make our neighbors aware of the activity through the newsletter and email broadcast. Please sign up to receive emails using the form on our Contact page. We will also make the HPD and the District One Constable's office aware of suspected or actual criminal activity in our neighborhood. 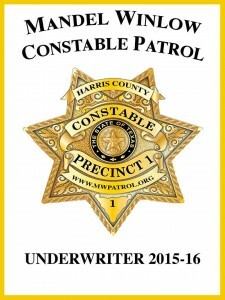 The HPD and Harris County Constable's office compile crime stats each month. HPD posts Each month's stats around the 25th of the following month. In addition to communicating to your neighbors in-person, email or by phone, there is also a very active private social network site called Nextdoor Neartown where neighbors in Neartown/Central Houston share valuable, timely information – on anything from suggestions for lawn care to tracking crime.